Professor Junko Tanaka (Department of Epidemiology, Infectious Disease Control and Prevention, Graduate School of Biomedical and Health Science, Hiroshima University) produced the international collaborated research project with collaboration of University of Health Science in Phnom Penh, Cambodia, Ministry of Health of Cambodia, the WHO Western Pacific Regional Office in Manila, Philippine, WHO Cambodia and CDC in USA. From February to April 2017, they had jointly conducted a large scale sero-epidemiological survey to reveal the prevalence of HBsAg among 5-7 year-old children and their mother in Cambodia. It is estimated that 400 million people are infected with hepatitis B virus infection worldwide and World Health Organization (WHO) has set the goal of elimination of HBV infection by 2030 and each country puts effort to meet the goal. As the result of this nationwide study, HBsAg prevalence among 5-7 year-old children was 0.56% and it could be clearly stated that Cambodia had achieved the 2017 WHO/WPRO regional goal of HBsAg prevalence among 5 year-old children to <1%. According to this research result, WHO / WPRO’s independent expert resource panel officially certified as having met hepatitis B control goal. This research study has possibility of introducing a model for scientific way of visualizing the current status of viral hepatitis and evaluating the effect of measures against hepatitis in developing countries. 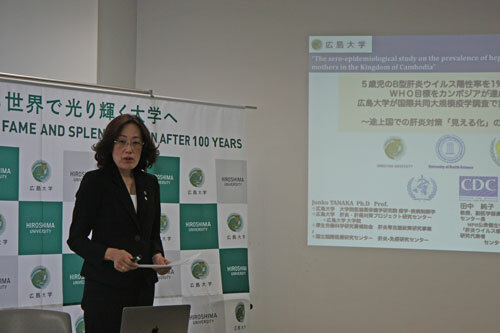 On 26th September, a press conference was held in Tokyo and Professor Junko TANAKA, Principle Investigator of this research, explained the outline of the study and the result.